Der Artikel Natalie Imbruglia: Left Of The Middle (180g) wurde in den Warenkorb gelegt. 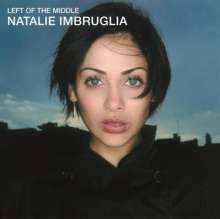 Left Of The Middle is the 1997 debut album by three-time Grammy nominee, songwriter, actor and model Natalie Imbruglia. Spurred by the success of the hit single »Torn«, the album became an instant worldwide success, peaking the charts in Australia and reaching Top 10 positions in album charts in the US, UK, Germany, Netherlands, Canada and Italy. Left Of The Middle went certified platinum just five weeks after its release date, eventually selling over 7 million copies worldwide. Imbruglia's first album became the largest debut for a new, alternative pop-rock female artist in history, selling more in its first week than records by Alanis Morissette, Meredith Brooks and Fiona Apple combined. Left of The Middle is finally available on vinyl for the very first time since the album's original release in 1997. Besides the huge hit »Torn« (85 million views on youtube), the album contains multiple classic tunes like »Big Mistake« (number 2 in the UK) »Smoke« (Top 5 in the UK) and »Wishing I Was There«.